Edward Thorp was the inventor of the card counting theory or strategy of blackjack and this is the most popular strategy of blackjack of this modern era. 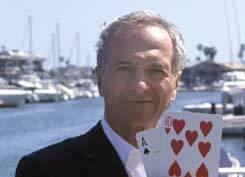 His full name was the Edward Oakley Thorp and this is the technique that made him immortal in the blackjack history. Beat the Dealer was the book where he first told about the card counting theory and the book was published in the year 1962 and the card counting system of the book was known as Ten Count System. This was not the 1st strategy to win the blackjack but it was the 1st mathematical strategy to win in the blackjack. If you use the strategy clearly in a blackjack game, the winning odds will increase and if you can not win then it will decrease the house edge to 1% from the usual 5% and that is something other strategies have failed to do. He had the MA degree in Physics and the PhD degree in mathematics and he got the latter from the UCLA in the year 1958. He was a teacher in different universities and the MIT, NMSU, UCLA and UC Irvine were those universities. He played roulette and blackjack with a friend and wife. In the year 1961 he spent around $10000 to prove the effectiveness of his theory and when he found that his theory working then he wrote the famous book of blackjack. When the published, many casinos changed their rules to prevent Thorp theory and many of the casinos changed their usual rules of playing blackjack. At the first the players were forced to play the new version of the game but soon they started to refuse the new rules and the casinos had nothing to do but having the old rules again and they only changed the 1-deck games with the 4-deck shoe games and this change was accepted by the blackjack players of that time. Thorp also wrote many other books about blackjack and different strategies of the game. The Hi-Lo card counting system was another invention of Thorp and it was the upgraded version of the original card counting strategy. In the year 1967, Beat the Market was published and in this book he described how to get a position on the blackjack market and there were many other books he wrote but Beat the Dealer was the book that changed his luck with the history of the game and that is the fact of Thorp.